Senate HELP committee chairman Lamar Alexander (R-TN) and the Trump transition conspired to hold Betsy DeVos's confirmation hearing to be Secretary of Education at the bizarre early bird special time of 5 pm. Faced with a billionaire nominee who has financial investments in education companies, has favored privatization over public education, has failed to finalize the necessary paperwork with the Office of Government Ethics prior to her hearing, and has contributed millions to the Republican Party, and is now opposed by leading civil rights and education groups and by 68 members of the congressional black, Hispanic, and Asia Pacific American caucuses, Alexander rejected repeated requests from the Democrats on the committee that each senator get more than one five-minute round of questions. It also was not reassuring that, when former Senator Joe Lieberman (D-CT) introduced DeVos, he failed to disclose that his law firm has represented Trump in numerous matters for 15 years. Senator Chris Murphy (D-CT) asked DeVos whether she had anywhere that she needed to be this evening that would preclude additional questions. When DeVos responded that she would defer to the chairman, Murphy said that Alexander's refusal to allow additional questions suggested that the GOP was "trying to protect this nominee from scrutiny." As a result, there was little time to ask any detailed questions, and almost no time to ask DeVos about the enormous controversy over for-profit colleges, many of which have over the past few decades used a toxic mix of deceptive recruiting, high prices, and low spending on education that has left many students -- veterans, single moms, and others -- deep and debt and without improved job prospects. The Obama Administration, fighting off hoards of well-paid lobbyists for the industry, has pressed ahead with increasingly strong measures to impose accountability measures on the for-profit college scam artists, who range from strip mall operators beauty schools to giant Wall Street owned chains. For-profit colleges have been getting as much as $32 billion a year from taxpayers in federal student grants and loans -- as much as a quarter of all such aid -- and many of these institutions have been under investigation for fraud by multiple federal and state law enforcement agencies. Until tonight, we hadn't received a serious public indication about what the /www.huffingtonpost.com/davidhalperin/trump-testimony-in-the-tr_b_12995642.html"}}">President of Trump University, which engaged in its own brand of deceptive predatory practices, will want to do about for-profit colleges once he becomes President of the United States. For-profit college owners and lobbyists have been giddy with expectations that the Trump administration will gut the Obama rules, even though doing so would undercut his pledges to fight against "}}">waste, fraud, and abuse with taxpayer dollars, to help working people get good jobs, to honor our veterans, and to drain the swamp of Washington corruption, and even though until the recent era when industry money has bought the GOP outright, Republican Administrations were traditionally committed to cracking down on for-profit college misconduct. Senator Elizabeth Warren (D-MA) was the first and only senator to really press DeVos on for-profit college accountability issues. 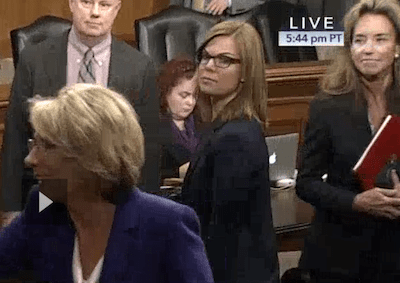 She asked DeVos, who admitted to have almost no higher education management or college aid experience, if she supported protecting federal taxpayer dollars from waste, fraud, and abuse? DeVos said yes. Warren said she was glad to know that, since Trump's higher education experience consisted of fraud so bad at his fake unaccredited university that he paid out $25 million to settle claims from students and New York's attorney general. Warren pushed, asking DeVos exactly how she would stop fraud. DeVos: "The individuals with whom I work in the Department will ensure that federal monies are used properly and appropriately." Warren pressed further, noting that there are already "a whole group of rules" written by the Obama Administration to protect college students. In particular, she asked DeVos whether she would commit to enforcing the gainful employment rule, which would penalize career college programs, whether at a for-profit, non-profit, or public college, that leave graduates with insurmountable debt. New data released by the Department confirms what for-profit colleges feared as they have lobbied fiercely against the rule: 98 percent of the programs flunking the test in its first year were for-profits. DeVos responded, "We will certainly review that rule and see that it is actually achieving what the intentions are." 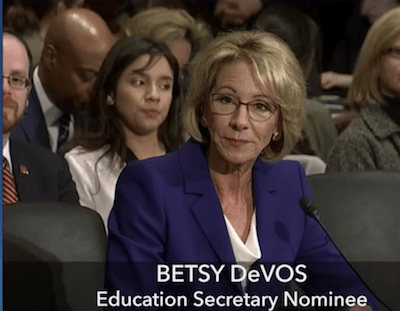 In a hearing where DeVos demonstrated a shaky knowledge of many issues related to her supposed area of expertise, K-12 education, DeVos seemed to have memorized that she was not supposed to embrace the higher education gainful employment rule. Warren shot back: "Swindlers and crooks are out there doing backflips when they hear an answer like this. If you can't commit to use the tools that are already available to you ... then I don't see how you can be the Secretary of Education." Unfortunately for the veterans and others who are being swindled into enrolling at predatory colleges even as you read this, and for the many more who will be swindled if the Trump-DeVos regime guts the gainful employment rule and other reforms, there is a way for DeVos to become secretary of education. That would be if the 52 GOP senators, many of whom drooled over DeVos during the hearing, vote for her. I fervently hope that a few of these senators actually demonstrate some concern for America's students, and the integrity of the Department of Education, and vote against. Even without the rules, continued investigative reporting on for-profit college abuses, advocacy work by pro-student organizations, and enforcement efforts by state attorneys general can help deter bad actors and protect the public from predatory schools. But a DeVos education department that sides with wealthy college operators over struggling students will disgrace itself and harm our country. One of DeVos's handlers at tonight's hearing was Lauren Maddox (pictured at right), a Bush Administration Assistant Secretary of Education for Communications and Outreach who serves on the Trump transition staff. A principal at the Podesta Group mega-lobbying firm, Maddox was a long-time registered lobbyist for the now discredited for-profit college trade group APSCU (now called CECU), for the predatory for-profit college company Career Education Corp., and for the student loan companies Sallie Mae and ECMC.